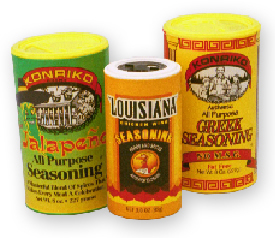 Whether it’s spice, salt, seasoning blends or any other dry ingredient, our cans meet your needs. We line the inside with foil or poly to protect against outside vapor. We glue in a variety of shaker tops so the consumer can easily dispense your product. With our labeling equipment we can provide full coverage to the packaging, making it ideal for retail. We provide bottom closures of metal, aluminum or friction fit plastic. Let our sales team help specify the right can for your needs.